For other people named Jerry Yang, see Jerry Yang (disambiguation). Jerry Chih-Yuan Yang (Chinese: 楊致遠; born November 6, 1968) is a Taiwanese-American Internet entrepreneur, engineer, and programmer. He is the co-founder and former CEO of Yahoo! Inc. Bachelor of Science, Electrical Engineering; Master of Science, Electrical Engineering. Founding Partner, AME Cloud Ventures. Yang was born with the name Yang Chih-Yuan in Taipei, Taiwan on November 6, 1968; his mother was a professor of English and drama and his father died when he was two, by which time Yang had a brother. In 1978, his mother moved the family to San Jose, California, where his grandmother and extended family took care of the boys while his mother taught English to other immigrants. After moving to the US Yang took the American name Jerry, his mother Lily, and his brother Ken. He says that he only knew one English word, "shoe", when he came to America, but became fluent in English in about three years. Yang earned both a Bachelor of Science and a Master of Science in electrical engineering from Stanford University in four years. He met David Filo at Stanford in 1989, and the two of them went to Japan in 1992 for a six-month exchange program, during which he met his future wife, who was there as part of the exchange program. Yang founded Yahoo! in 1994, served as CEO from 2007 to 2009. He left Yahoo! in 2012. He founded a venture capital firm called AME Cloud Ventures and, as of 2015, serves on several corporate boards. According to Rob Solomon, a venture capitalist at Accel Partners, Yang was "a great founder, evangelist, strategist and mentor", having "created the blueprint for what is possible on the Internet". While studying at Stanford in 1994, Yang and David Filo co-created an Internet website called "Jerry and David's Guide to the World Wide Web", which consisted of a directory of other websites. As it grew in popularity they renamed it "Yahoo! Inc.". Yahoo! received around 100,000 unique visitors by the fall of 1994. In April 1995, Yahoo! received a $2 million investment from Sequoia Capital, Tim Koogle was hired as CEO, and Yang and Filo were each appointed "Chief Yahoo". Yahoo! received a second round of funding in the Fall 1995 from Reuters and Softbank. It went public in April 1996 with 49 employees. In 1999, Yang was named to the MIT Technology Review TR100 as one of the top 100 innovators in the world under the age of 35. Terry Semel, who replaced Koogle as CEO after the dot-com bubble crash, served until 2007 when the rise of Google led the board to fire him and appoint Yang as interim CEO. Yang met Alibaba founder Jack Ma in 1997 during Yang's first trip to China. Ma, a government-employed tour guide and former English teacher, gave Yang a tour of the Great Wall of China. The two hit it off and discussed the growth of the Web. Ma created Alibaba several months later. A 1997 photo of Yang and Ma at the Great Wall still hangs on the wall in Alibaba's Hangzhou office. In 2005, under Yang's direction but before he took over as CEO in 2007, Yahoo! purchased a 40% stake in Alibaba for $1 billion plus the assets of Yahoo! China, valued at $700 million. In 2012, Yahoo! sold a portion of its stake in Alibaba for $7.6 billion. The company made an additional $9.4 billion in Alibaba's 2014 IPO. Eric Jackson, the founder of hedge fund Ironfire Capital, called Yahoo! 's investment in Alibaba "the best investment an American company has ever made in China," and stated, "Jerry deserves enormous credit for that." In fall 2005, a month after the Alibaba investment, news broke that Yahoo! had cooperated with Chinese authorities in the arrest of Chinese journalist Shi Tao in November 2004. Shi had used a Yahoo email address to anonymously notify a pro-democracy website in the US that the Chinese government had ordered the Chinese media not to cover the fifteenth anniversary of the Tiananmen Square Protests of 1989 on June 4. Yahoo! provided the Chinese security agencies with the IP addresses of the senders, the recipients and the time of the message. Shi was subsequently convicted for "divulging state secrets abroad". Yang justified the action, stating: "To be doing business in China or anywhere else in the world, we have to comply with local law[s]." Yang and Yahoo! were heavily criticized, and Reporters Without Borders called Yahoo! "a Chinese police informant". In April 2007, Wang Xiaoning and other journalists brought a civil suit against Yahoo! for allegedly aiding and abetting the Chinese government which, it was claimed, resulted in torture that included beatings and imprisonment. In early November 2007, Yang faced questions from a Congressional committee with respect to Yahoo! 's role in the arrests of Tao and other journalists in China. During the hearings he apologized to Tao's mother, who was also at the hearing. A week later, Yahoo! agreed to settle with affected Chinese dissidents, paying them undisclosed compensation. Yang stated, "After meeting with the families, it was clear to me what we had to do to make this right for them, for Yahoo, and for the future." That week, Yang established the Yahoo! Human Rights Fund, a fund to provide "humanitarian and legal support" to online dissidents. In February 2008, Secretary of State Condoleezza Rice said that she raised issues about jailed Chinese journalists with her Chinese counterpart Yang Jiechi; she cited a letter from Jerry Yang requesting her assistance in freeing the jailed dissidents. Late in 2008, the Laogai Museum opened; the museum was run by noted Chinese dissident Harry Wu and showcased China's laogai penal system. It was funded by the Yahoo! Human Rights Fund. In February 2008, Microsoft made an unsolicited offer to buy Yahoo! for $44.6 billion; at the time Yahoo! was still struggling to catch up to Google, while Microsoft was still seeking an internet strategy. The offer was a 62% premium to Yahoo! 's market value at the time. The negotiations were difficult, as Yang had no desire to sell Yahoo! and would not make a counter offer. Once the negotiations ended in failure in May 2008, Yahoo! 's stock price plunged. Yang and board chairman Roy Bostock were strongly criticized by investors for their handling of negotiations, which later led to several shareholder lawsuits and a proxy fight led by Carl Icahn, which was settled in July 2008. Yang's response to the Microsoft takeover was to make a commercial search advertising arrangement with Google but they ended negotiation after U.S. authorities voiced concerns regarding the effect on competition in the market. On November 17, 2008, The Wall Street Journal reported Yang would step down as CEO as soon as the company found a replacement. He served as CEO until 2009, when Yahoo! named Carol Bartz as CEO. He regained his former position as "Chief Yahoo" and remained on Yahoo's board of directors. In January 2012, Yahoo! announced that Yang was leaving the company and would be resigning from the board and all other positions at the company. The company also announced his resignation from the boards of Yahoo! Japan and Alibaba Corp.
After leaving Yahoo! he became a mentor to technology startups and an investor through his firm, AME Cloud Ventures. AME (pronounced "ah-meh") has provided funding to more than 50 startups, including Tango, Evernote, Wattpad, Vectra Networks Inc., and Chinese travel site Shijiebang. "Ame" means "rain" in Japanese, a nod to Yang's interest in cloud computing. He re-joined the board of Alibaba in 2014. Yang is married to Akiko Yamazaki, a Japanese woman who was raised in Costa Rica, whom he met in 1992 during a 6-month Stanford exchange program when they were both students there. Yamazaki graduated from Stanford University with a degree in industrial engineering and is a director with the Wildlife Conservation Network. Yang currently resides in Los Altos Hills, California. In February 2007, Yang and his wife gave $75 million to Stanford University, their alma mater, $50 million of which went to building the "Jerry Yang and Akiko Yamazaki Environment and Energy Building", a multi-disciplinary research, teaching and lab building designed with sustainable architecture principles. In late 2012 and early 2013, the Asian Art Museum of San Francisco exhibited selections from the Chinese calligraphy collection belonging to Yang and his wife. He began the collection in the late 1990s; it contains about 250 pieces. These selections also appeared at the Metropolitan Museum of Art in the 2014 exhibition "Out of Character: Decoding Chinese Calligraphy." In September 2017, Yang and Yamazaki pledged $25 million to the Asian Art Museum, the largest donation in the museum's history. ^ a b "#869 Jerry Yang". Forbes. ^ "Jerry Chih-Yuan Yang". Boardroom Insiders. November 7, 2014. Retrieved April 30, 2015. ^ Pickert, Kate (November 19, 2008). "Yahoo! CEO Jerry Yang". Time. ^ Sherman, Josepha (2001). Jerry Yang and David Filo : chief yahoos of Yahoo!. Brookfield, Conn.: Twenty-First Century Books. ISBN 9780761319610. ^ a b c d Schlender, Brent (March 6, 2000). "How A Virtuoso Plays The Web". Fortune. Retrieved November 8, 2008. ^ Solomon, Rob. "Yahoo Was the GE of the Internet". recode.com. Recode. Retrieved January 26, 2015. ^ "1999 Young Innovators Under 35: Jerry Yang, 29". Technology Review. 1999. Retrieved August 14, 2011. ^ a b Helft, Miguel (September 18, 2014). "Jerry Yang: The most successful American investor in China?". Fortune. Time, Inc. Retrieved January 5, 2015. ^ Novellino, Teresa (October 1, 2014). "Inside Jerry Yang's wild bet on Alibaba and Jack Ma". Upstart Business Journal. American City Business Journals. Retrieved January 5, 2015. ^ Reporters Without Borders. September 6, 2005 Information supplied by Yahoo ! helped journalist Shi Tao get 10 years in prison. ^ Boudreau, John (November 7, 2007). "Lawmaker scolds Yahoo: 'Morally you are pygmies'". The Mercury News. Retrieved November 14, 2007. ^ "Press Release: Yahoo! Inc Reaches Settlement On Lawsuit Works To Establish Human Rights Fund" (PDF). Yahoo!. November 13, 2007. ^ "Rice presses China on jailed dissidents". The New York Times. February 27, 2007. ^ Fowler, Geoffrey A (November 12, 2008). "Yahoo-Sponsored Chinese Human Rights Museum Opens in Washington". The Wall Street Journal. Retrieved December 12, 2008. ^ "Yahoo weighs up options". Financial Times. February 3, 2008. ^ a b Lohr, Steve (May 5, 2008). "Microsoft's Failed Yahoo Bid Risks Online Growth". The New York Times. Retrieved May 6, 2008. ^ Rob Hof for Bloomberg BusinessWeek TechBeat July 21, 2008 Yahoo Settles Proxy Fight With Icahn; What's Next? ^ Michael Liedtke (November 18, 2008). "Yahoo! to Replace Yang as CEO". TheStreet.com. Archived from the original on December 12, 2010. Retrieved September 11, 2009. ^ Deruy, Emily (August 11, 2017). "Stanford adds Yahoo! co-founder Jerry Yang to its board of trustees". The Mercury News. Retrieved November 29, 2017. ^ Perez, Sarah. "Backed By $9.5 Million, Curbside Launches A Mobile Shopping App For Same-Day Pickup, Not Delivery". TechCrunch. Retrieved May 24, 2017. ^ Profile of Jerry Yang. Forbes.com (March 29, 2011). Retrieved on 2012-01-09. ^ Seno, Alexandra A. (October 12, 2012). "Worthy Characters". The Wall Street Journal. Retrieved January 5, 2015. ^ Rosenberg, Karen (June 19, 2014). "A Calligraphic Answer to 'I Like This'". The New York Times. Retrieved January 5, 2015. ^ Finkel, Jori (September 26, 2017). "Yahoo Co-Founder Gives $25 Million to San Francisco's Asian Art Museum". The New York Times. Retrieved November 29, 2017. 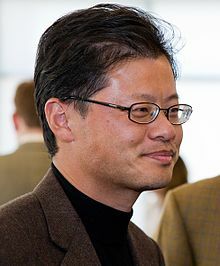 Wikimedia Commons has media related to Jerry Yang (entrepreneur). "Jerry Yang collected news and commentary". The New York Times. Terry Semel Chief Executive Officer of Yahoo!